Cool seo tools offer free domain IP lookup tool which helps you to convert domain to IP address. If you are looking for such type of tool then you are in the right place. The tool only converts domain into IP without any third party API's. In olden days, the website developer and the site owner use the command prompt to get the IP address of the domain. So it is used to take a lot of time and complicate process to configure or identifying IP address. In the recent decade domain name and IP became most popular for an online business to host domain name. To make hassle-free for getting an IP address of the domain name, we developed a domain IP lookup tool which converts easily from domain to IP within a matter of seconds. There are many ways to detect IP address which consumes a lot of time, so domain IP lookup became a common and friendly tool for webmasters where they can check for malware issues, configuring site and connecting to email servers. The tool saves a lot of time identifying an IP address for a specific domain instead, they can focus on marketing and building necessary website traffic to grow their site. With the help of the IP address, we can easily track the hosting location, malware attacks, ping attacks and other viruses that are infecting it. So the server admin can easily monitor the IP performance and how well the data is transferring from server to the client-side browser. It makes monitoring the site easier and faster. Getting an IP address manually from domain name requires special skills and can be tricky. But the tool like domain IP lookup tool is considered as one of best tool that is created by our development team. In order to know the IP address of the domain, this tool helps you identify the IP address of the current country location and domain information. You have seen IP address for phone, tablets and Personal Computer (PC) in which the devices will communicate with each other to transfer data from one place to another. If your domain is hacked by an intruder, you can still track his location with the help of domain IP lookup tool. Each time when a user hosts a website on the server, a unique IP address is provided to the web hosting to configure domain & the server for businesses or personal blog. Using this domain IP lookup tool, it will help to identify the IP address of the domain and location of the server. So what is exactly an IP address? Already know IP address is an Internet protocol that is used to communicate with one device to another device and also performing various Internet activities around the world. To change the domain to IP, just check your website using our domain IP lookup tool. The internet is flooded with malicious activities constantly posing a threat to your website. Therefore, you must be prepared to roll up your sleeve and take action when needed. For instance, it may so happen that you see a random Internet Protocol address that is trying to make it through your firewall in order to gain access to your system. Such activity is certainly questionable and harmful to your website. In such cases, before taking on the offensive, you can find out the details about the Internet Protocol address that seems to be a potential threat. Initially, website owners and webmasters used Command Prompt to detect the Internet Protocol address of a domain name. However, this was time complicated and time consuming for online business owners. Finding the Domain IP address manually is a tedious and tricky task. Over time, the Domain IP Lookup Tool introduced to ease the task. 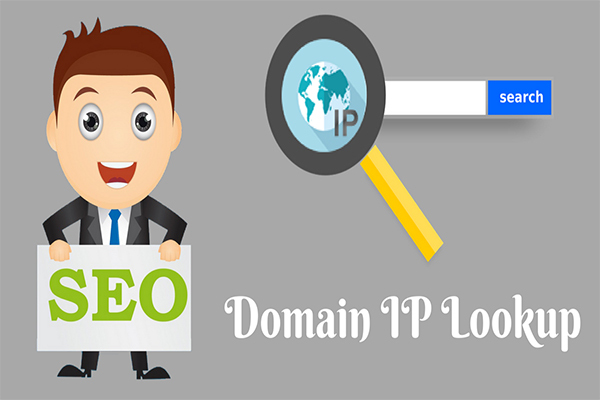 What is Domain IP Lookup Tool? The Domain IP Lookup tool is a free online tool that you can use to search for the Internet Protocol address of any domain name. So, you can use this lookup tool to find the details about the Internet Protocol address that is trying to break through your firewall. With this lookup tool, you can find important information about the Internet Protocol address such as the location and also check for any malicious activity. The tool also tells you about the Domain IP address and its status on the internet. Instead of spending time searching for domain IP information via command prompt, webmasters and website owners can now use this Domain IP Lookup Tool in formulating marketing strategies and optimizing their website. Why do we need Domain IP Lookup tool? Thus, this makes monitoring websites easy and fast along with other tools. How does this domain IP tool work? First, the user enters a domain name in the respective text box, whose Internet Protocol address that you want to look for. Next, the user enters the captcha code in the given box. Click the Submit button and wait for the results to appear. This tool also allows you to check for 1 Domain IP addresses. Some tools also allow you to enter up to 10 domains. The tool may scan the Whois information of the domain and displays an IP address of the domain. To block malicious malware attacks from the internet. Additionally, converting a domain name into Internet Protocol address is crucial for search engine optimization. This is because every time you visit a site, the hit goes to the designated Internet Protocol address. Computers can read such statistical IP addresses. Search engines link IP addresses related to your website. Sometimes you may find irrelevant links connected to your website. Therefore, it becomes highly significant to record such irrelevant links so that you can disavow them using the disavow tool. Some other times, there will be some links relevant to your website waiting for your approval. Therefore, it is important to identify the Internet Protocol address and the website they are coming from so that you can approve them. Also, by converting a domain into Internet Protocol address, you can identify and keep unprotected Internet Protocol addresses at bay with a view to safeguarding your website. Search engines like Google, Yahoo and Bing would most likely go for websites which are safe and free from viruses. You can also you the Whois Lookup tool that lets you find out details about a domain name. Once you know the Domain IP address that pokes you, you can find out details of the domain owner and take the necessary steps. You only need simple details to look up for the required domain details. All you need is the website or domain address to view the details. However, the Whois Lookup tool only gives out public information about domains that are registered. So, use the Domain IP Lookup device and keep safeguard your online presence.